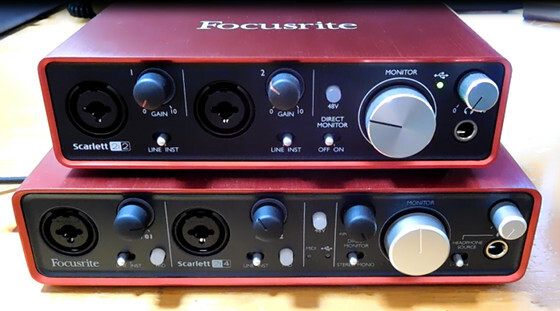 For this review I’m going to compare the 2nd generation Focusrite Scarlett 2i2 USB audio interface with the 1st gen 2i4 model, and list the differences between the 1st and 2nd gen Scarlett models in general. I bought a 1st gen Scarlett 2i4 a few months ago and it has worked out well for recording guitars and bass (both DI and with a mic) but the latency becomes troublesome at times, like when recording e-drums using an Alesis DM10 with a software plugin such as EZdrummer. So when I heard that Focusrite had released new 2nd gen models with “super-low latency” I ordered a new 2i2 to see how it compares. Focusrite fixed the issue with hot pickups on the 2nd gen 2i2 and Solo units so I no longer needed to get a 2i4 with the PAD button to lower the input with active pickups. There are 6 different models in the Focusrite Scarlett lineup, the entry-level Solo, the 2i2, 2i4, 6i6, 18i8 and 18i20. The first number in the model name indicates the number of inputs and the second is the number of outputs. They all have the same preamps and converters. The differences between them comes down to the number of inputs and outputs and some extra features on the higher up models. There’s this page on Focusrite’s website with more details about the improvements with the 2nd generation Scarlett interfaces: Scarlett in Depth. Below is a summary with some added thoughts. Latency – The most notable difference between the 1st and 2nd generation Focusrite Scarlett audio interfaces is the lower latency on the newer models. With my Windows setup, the lowest possible overall latency on the 1st gen 2i4 is 9.5 ms; with the 2nd gen 2i2 the lowest possible latency is 3.06 ms. See this earlier post for more details: Scarlett 2i2 (2nd Gen) vs 2i4 (1st Gen) Latency Comparison. Update: In an odd twist, it turns out the 1st gen Scarlett interfaces can work with the 2nd gen drivers for the same low latency settings. Improved Instrument Input – The preamps on the 2nd gen models remain the same as the 1st gen, so the overall sound is identical, but they improved the instrument input to add 8dB more headroom. This makes it so there won’t be clipping problems with hot/active pickups. The 1st gen 2i2 and Solo models had problems with that since they lack a PAD button (that’s why I ended up with a 2i4). I tested the 2nd gen 2i2 using a guitar with Seymour Duncan Blackouts and it indeed works well without clipping. Surge Protection – Focusrite added surge protection circuits to the inputs and outputs of the 2nd generation Scarlett models. Higher Sample Rates – Focusrite updated the converters on the 2nd gen Scarlett interfaces to support up to 192 kHz sampling at 24-bit. The 1st gen interfaces top out at 96 kHz. Drivers – The 2nd gen models have new lower-latency drivers for Windows computers but Focusrite has said that they plan to update the drivers for the 1st Gen Scarlett interfaces as well to help improve latency performance (by how much remains to be seen). I experienced crackling issues with the 2nd gen drivers initially but then Focusrite updated them and now they’re working very well, although I have encountered a bug on a couple of occasions that causes audio to start popping and the CPU usage to jump around erratically, but momentarily toggling the buffer size fixes it so it’s been a minor issue thus far. Visual Changes – The 2nd gen models include a few visual updates. The gain knobs have red lines on them and the monitor and headphone knobs have black lines—I like the change because it makes it easier to see the levels, and the knobs are better quality on the 2nd gen. The contrast of the writing on the front is also easier to see on the 2nd gen models. Additionally, the 2nd gen interfaces have a white Focusrite logo on the top whereas the 1st gen models have a black logo. Included Software – For the most part the 1st and 2nd generation models come with the same software package, which includes several freebies. The one difference is the 2nd gen models add a Pro Tools First Focusrite Creative Pack. Pro Tools First is free to use anyway but the Creative Pack adds 12 effect pedal plugins (flanger, phaser, distortion, etc). I have Pro Tools 12 and have used some of the pedals before and they sound good so that’s a nice bonus. Here’s a list of differences between the Scarlett 2i2 and 2i4, not generation specific. The first thing that jumps out about the 2i2 is how much smaller it is than the 2i4. 2i4: 48 x 210 x 140 mm; 890 grams – 2i2: 45 x 175 x 100 mm; 580 grams. The 2i4 has the option to set the headphone jack to outputs 1-2 or 3-4, so the headphones can be used independently from the main output. The 2i4 adds MIDI I/O (most MIDI devices support USB these days so it’s not a big advantage unless you have a specific need for it). PAD button lowers input sensitivity by 10dB on the 2i4. The 2i2 has a direct monitor switch if you want to hear your input directly through the interface’s outputs without latency; the 2i4 has a dial to blend direct monitoring with playback, along with an added stereo and mono switch. Both models have balanced line outputs but the 2i4 adds 2 sets of unbalanced RCA outputs. At first I experienced a number of problems with the 2nd gen drivers so I thought I would just end up sticking with the 1st gen 2i4 since it has been so reliable, but after Focusrite updated the 2nd gen drivers the Scarlett 2i2 is working so well that I decided to keep it instead. The lower latency is a big plus for what I use it for and that also helps lower overall CPU usage as well because you can use higher sample rates that use less CPU without latency being as high as with the 1st gen models. For people that already own a 1st generation Scarlett interface and are wondering if you should upgrade to a 2nd Gen Scarlett interface or not, it mostly comes down to latency. The lower latency is enough of a reason to upgrade to the 2nd generation for what I use it for, but if you don’t find the latency an issue with the 1st gen models then there really isn’t much of a reason to upgrade unless you want to record at higher sample rates or need the increased headroom for hot pickups. The preamps and overall sound quality is the same on both generations, and each model still has the same general features and the same name as before. Great, first real review of this sec gen. Thanks! The only problem is as I start to do the main review of the 2i2 I realize there’s not a whole lot to add that I haven’t already said here in this article and the latency comparison…. Did they improve the headphone output in the 2nd generation? Also I believe there’s a Scarlett Solo 2nd gen. What’s the difference between that and the 2i2? I guess they did improve the headphone output as well, according to that Scarlett in Depth page. It says, “we’ve given the headphone outputs in the next-generation Scarlett range plenty of power so they’ll drive high-quality headphones with more than enough volume”. I think I remember reading some complaints of it not being loud enough or something on the 1st gen but I never had that problem with the 2i4. The Solo is a lot like the 2i2 but it has RCA outputs instead of the balanced 1/4″ TRS connectors on back, and it doesn’t have the combo jacks on front so it can only connect one mic and one instrument at a time. The headphone jack also has it’s own separate volume dial on the 2i2. I’m currently trying to decide between the 2i4 ist Gen (which I can get for about £15 less than the 2nd Gen 2i2 in the UK) and was wondering if the 2i4’s dial to blend direct monitoring with playback made a difference with the latency? I’m a jazz guitarist so have vintage pickups and would be going in from my Hughes and Kettner amp’s Red Box DI at line level. The 2nd gens are definitely worth it for the lower latency alone when it comes to guitars. The blend knob is pointless when the latency is low enough not to need it. Plus I never liked it anyway because you have to hear the dry signal and that takes the life out of playing. The latest beta drivers for the 1st gens might have lower latency like the 2nd gens but I have no way to test since I got rid of the 1st gen 2i4. You won’t need to use the DI box but you can if you want. Thanks, Nathan. It’s going to be the 2i2 2nd gen, I think. Very helpful review and video, thanks Nathan! My question: If input signal from hot/active pickups is clipping, can’t you just turn down the gain? In other words … what is the link between PAD button and gain knob? The problem is it clips with the gain turned all the way down. The Pad button drops the level by another 10dbs.